Security updates, as most of you'd agree, are very important. On Linux, it's always advisable to keep the installed packages up to date, especially when it comes to security. In general, users should apply security updates to their Linux systems within 30 days of being released. In this tutorial, we will discuss how you can configure a CentOS 7 server for automatic security updates. This will make sure the system automatically downloads packages and applies all security updates without any manual intervention. Yum-cron is a command-line tool to manage system and package updates on CentOS systems. The utility is available in the CentOS 7 repository. You can install it using the command below. That's it. Yum-cron is now properly installed on your CentOS 7 server. After installing the yum-cron package, we need to configure it for automatic updates. By default, yum-cron provides three kinds of updates: default update using yum upgrade command, minimal update, and security update. Note that in this tutorial, we will configure yum-cron for security updates (related to both system and packages). So let's begin. 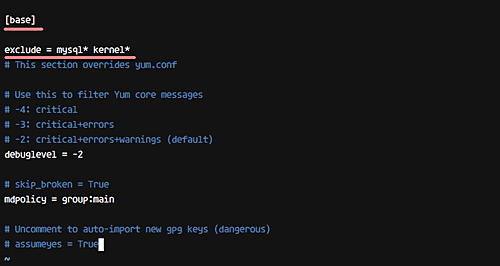 As a first step, go to the 'yum' configuration directory and edit the 'yum-cron.conf' file using the Vim editor. Note: Of course, you can use any other editor of your choice. And for those who want to learn Vim, check out our comprehensive tutorial here. In the file, head to the line beginning with the string 'update_cmd', and define the kind of update you want to use. For example, in this tutorial, we are focusing only on security updates, so change the value from 'default' to 'security'. Similarly, head to the line beginning with the 'update_messages' string, and make sure its value is 'yes'. Then do the same for 'download_updates' and 'apply_updates' lines. So whenever there's a security update available, the system will now automatically download the required packages and then apply all the updates. Next up is message notification configuration. Basically, Yum-cron provides two ways: either you can have notifications displayed on STDIO, or have them sent to an email address. For this tutorial, we will be going with the second option, which is email. 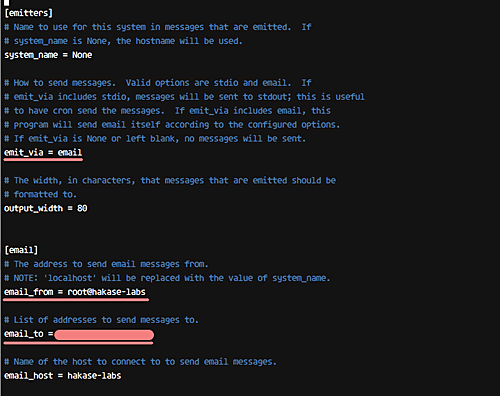 So change the value of 'emit_via' to 'email' as shown below. That's it. Now save the file and exit the editor. At this stage, any security updates on the system will be automatically downloaded and applied using yum-cron on daily basis. Sometimes, for whatever reason, we don't want to apply automatic updates on some packages, including kernel. In this step, we will discuss the configuration that'll let you disable updates for select packages. So the first step here is to edit the configuration file yum-cron.conf, which resides in the yum configuration directory. Now just save the changes and exit. Yeah, you guessed it right, now you'll have to restart the yum-cron service. So in our case, all packages with names beginning with 'mysql' or 'kernel' will be disabled for automatic updates. Yum-cron uses a cronjob for automatic security updates, and all logs for this cron is available under the '/var/log' directory. So you need to head to the '/var/log' directory to access the 'cron' log file. And in case you want to see the packages that have been updated, you can check the yum.log file. yum security will not work in centos 7. 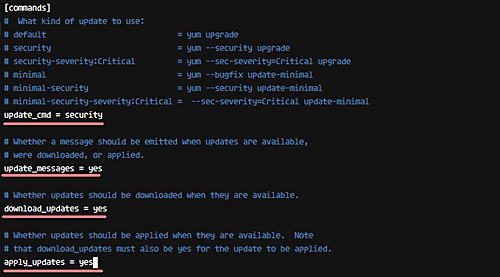 The yum repos for Centos 7 does not provide the metadata required for yum security update. It won't install all the security packages. These instructions are for a real RHEL server. For CentOS they do not apply as Nagarajan points out in previous comment. The crons under cron.daily/ cron.hourly/ cron.monthly/ cron.weekly/ using /etc/yum/yum-cron-hourly.conf. Any additional changes after installed yum-cron will not effect crons behavior. So we need to run below command i guess. It is aways a better option to configure a service prior to starting it the first time. Particularly when you are configuring a service that have the ability/intent to change/update packages.